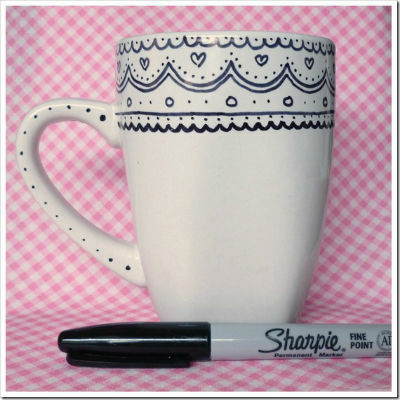 In the past few months I saw many pins on pinterest about plain mugs painted with Sharpie. I loved the way some mugs have come out! 1. The style of this one is very simple and delicate! I love the spots on the handle. 2. 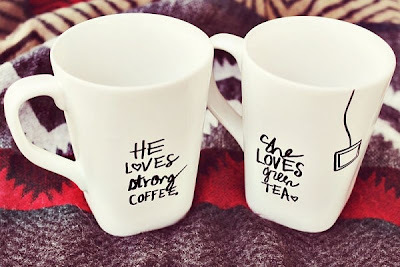 These two mugs are fantastic!! It is a very original and personal idea: well done to Elsie ;) Now, if I had to follow this idea, both mugs would be about coffee..no green tea in my house! 3. 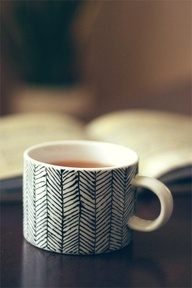 This mug is beatiful! My first thought was "the person who made this has a lot of patience!" I couldn't be that good! After so much inspiration I decided to create my own personal mug! You see "The baking book"? mmmmh :) I can't wait to start working on it! Do you like my two love owls? These are so adorable! Oh, now I am going to have to decorate a mug for myself! Super idea! Thank You!! The thing is that they are so easy to make and you can be very creative ;) they can be personal mugs but also nice presents.